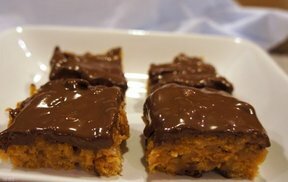 Moist and tasty peanut butter bars. 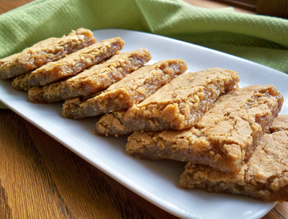 If you like peanut butter, these bars are for you. They are full of peanut butter flavor. Mix all of ingredients together in a large bowl. Place in an 11 x 17-inch pan and bake for 20 - 25 minutes at 350° F.
When you remove the bars from the oven, they won't look done, but the bars will set up while they cool. 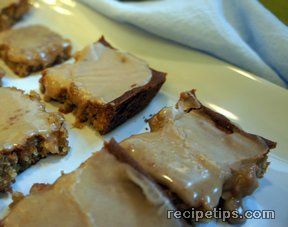 Make a basic powdered sugar frosting if you would like to frost the bars, but add 1 tablespoon (or more to taste) of peanut butter to the frosting. 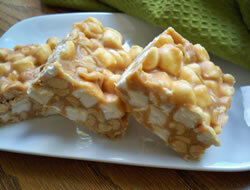 Note: If you prefer bars that are a little less doughy, add 5 or 10 minutes to the baking time. "The bars had great taste but I baked them for an additional 10 minutes and they were still doughier than I prefer. Next time I will bake them for at least 45 minutes."